Asgog Castle. View of interior of West wall. Generally as described. The remains of Castle Ascog measure 13.0m N to S and 9.5m E - W with the W wall surviving to gable height. Visited by OS (IA) 31 October 1972. No change to field report of 31 October 1972. Visited by OS (B S) 7 October 1976. The shattered remains of this late medieval tower-house stand on a low knoll on the NW shore of Asgog Loch, 2km from Loch Fyne. The level of the loch, which contained several crannogs (see Introduction) has been raised during the present century, and a massive revetment-wall which now rises from the water formerly bounded a track running along the shore (en.1). The area to the SW, used as gardens by the adjacent cottages, is now overgrown, and no remains of the supposed courtyard are identifiable (en.2). The tower measured 14.2m from NE to SW by about 10.3m over walls 2m in average thickness. Following its destruction in 1646 (infra), the SE side-wall has disappeared, but parts of the other walls stand to the original wall head-height of about 15m. It comprised a vaulted ground floor, and probably two upper storeys; one of these is said also to have been vaulted (en.3), but the inner face of the NW wall is now obscured by ivy and the springing is no longer visible. The masonry is of local random rubble, founded on bedrock at the NW and laid in coarse lime-mortar, but some openings have dressings of white and red sandstone, probably from Arran. The ground floor was vaulted longitudinally, and the scar of the vault is visible in the SW end-wall which contains a splayed window within an arched embrasure. The vault has collapsed except at the NW angle where its springing was supported by a 0.7m skin-wall added to the thick NE wall, which incorporates two mural chambers divided by a central passage leading by a dog-leg stair to the first floor. One of these chambers, entered from the passage, has a sunken floor and a steep corbelled vault, and may have been a prison; a mason's mark is incised on the SW jamb of its doorway. The other chamber, entered directly at the NW angle of the main vault, is itself barrel-vaulted transversely and is lit by a slit-window in the NE wall. The main room was also lit by a splayed window in the NW wall, but there is no evidence of an entrance either at this or a higher level, and these were presumably in the vanished SE wall. Little is identifiable of the first-floor arrangement, but there are traces of a garderobe-chamber in the NW angle, which was severely damaged by the collapse of the outer angle sometime after 1914 (en.4). A drawing made before that event shows that the ground-floor opening of the flue was round-arched, but only one side of the ingo survives. The access between the first and second floors is not preserved, but a short section of a lintelled mural stair, lit by a small slit-window and evidently leading to the wall-head, is preserved high in the SW gable. 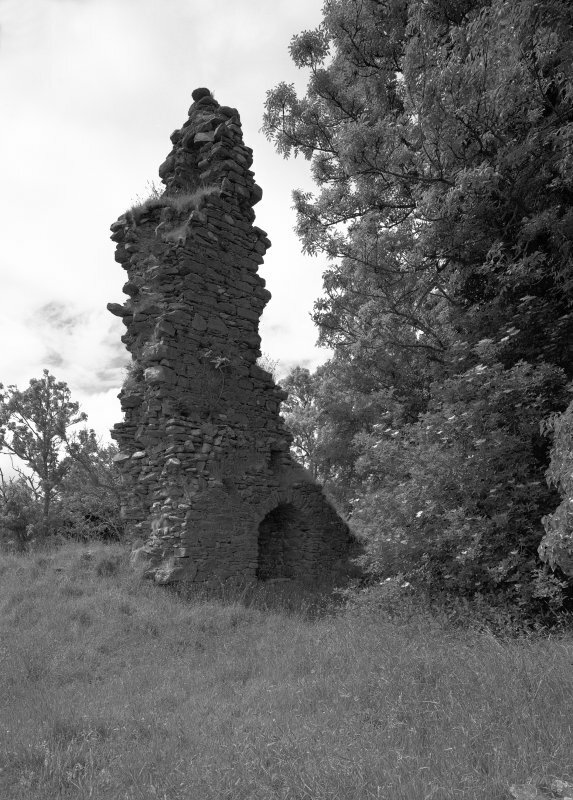 Although Asgog Castle is first recorded as a 'fortalice' in1581, the tower bears a close similarity to the mid-15thcenturyone at Kilchurn, Lorn (en.5), and may be attributed to the same period. It was the seat of a cadet branch of the Lamont family, who held from the Lamont barony of Inveryne an estate of six townships valued at £20, for which naval service was owed with a birlinn. Robert Lamont of Asgog is first recorded, as a witness, in 1477, and in 1554 his descendant John Lamont became heir also to the Ardlamont family, although not to their property (en.6). The castle's position near Loch Fyne was of strategic importance when in 1645-6 Sir James Lamont of Inveryne joined the Royalist army of Alasdair MacDonald in ravaging the Campbell territory beyond the loch. Robert Lamont of Asgog entertained Sir James at his 'House of Ascog' early in1646, and two skirmishes with Campbell forces took place int he vicinity before the castle was besieged in May by a party under Campbell of Ormsary. Following the capitulation of Toward (No. 139), in the next month, the garrison surrendered on the orders of its own captured chief, and many were massacred at Dunoon. The principal members of the Asgog family were killed or died in captivity, and the tower itself was plundered and burnt. After the Restoration, the estate was claimed by the Lamont chiefs of Inveryne, and there is no evidence that any attempt was made to re-occupy the castle (en.7).